Chuck Norris is no longer the toughest guy on the Internet. Despite various "Chuck Norrisfacts" you may have heard — "Duct tape uses Chuck Norris to hold things together," "Chuck Norris destroyed the periodic table because the only element Chuck Norris recognizes is the element of surprise," etc. — Chuck has met his match. "Killed Dracula with a pair of candlestick holders. Blew up Alderaan. Fought Daleks. Has been to the Earth's core. Killed more vampires than Buffy. Outsmarted Moriarty. Verbally bitchslapped Darth Vader. I beg your pardon, but do you really think Chuck Norris can top that?" And who, pray tell, fits that description? 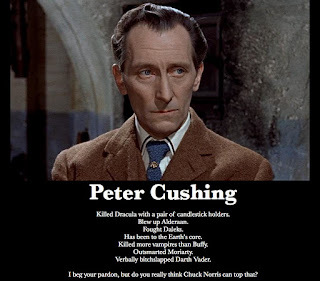 Only one man: Peter Cushing. Although not as famous today as his longtime friend and costar Christopher Lee, Cushing was just as important to the success of the second great era of horror films, spanning almost two decades from the late 1950s to the early '70s. Working together and separately, Cushing and Lee were their generation's equivalent of Boris Karloff and Bela Lugosi. Cushing was arguably the finest actor of all of the horror icons. Whether playing an upright hero or a depraved villain, his performances were precise, measured and deadly serious. His Baron Frankenstein in 1957's "Curse of Frankenstein" marked the first time the character was played as an outright villain, rather than as a flawed, tragic hero undone by hubris. And his Dr. Van Helsing in the following year's "Horror of Dracula" was a bold, energetic take on the character. For the first time, Dracula's arch nemesis was an action hero, and their final showdown remains the screen's best confrontation between the vampire and the professor. Cushing was the face of British horror, both for Hammer Films and Hammer's chief rival, Amicus. Cushing appeared in virtually all of Amicus' signature anthology films, from "Dr. Terror's House of Horrors" in 1965 to "From Beyond the Grave" in 1974. Amicus also cast Cushing in numerous sci-fi films, most notably as the Doctor in two movies based on the BBC television series "Doctor Who" — "Doctor Who and the Daleks" and "Daleks' Invasion Earth: 2150 A.D." — and as a scientist in the Edgar Rice Burroughs adaptation "At the Earth's Core." Cushing was Sherlock Holmes in the first color Holmes film, Hammer's 1959 version of "The Hound of the Baskervilles," and he also played the Great Detective on television for the BBC. But in a way, what has become Cushing's best-remembered role outdoes them all. As Grand Moff Tarkin, military governor of the Galactic Empire's outer rim in the original "Star Wars," Cushing put Darth Vader in his place. He then ordered the Death Star's destruction of Alderaan, population 1.97 billion, just because he could. That's first-class villainy. It tops anything else in the other "Star Wars" movies and, let's be honest, Chuck Norris has no answer for it. Yet, by every account, the real Cushing was one of the nicest people you could ever know. He was a man so in love with and devoted to his wife that when she died in 1971, he started to slowly waste away. 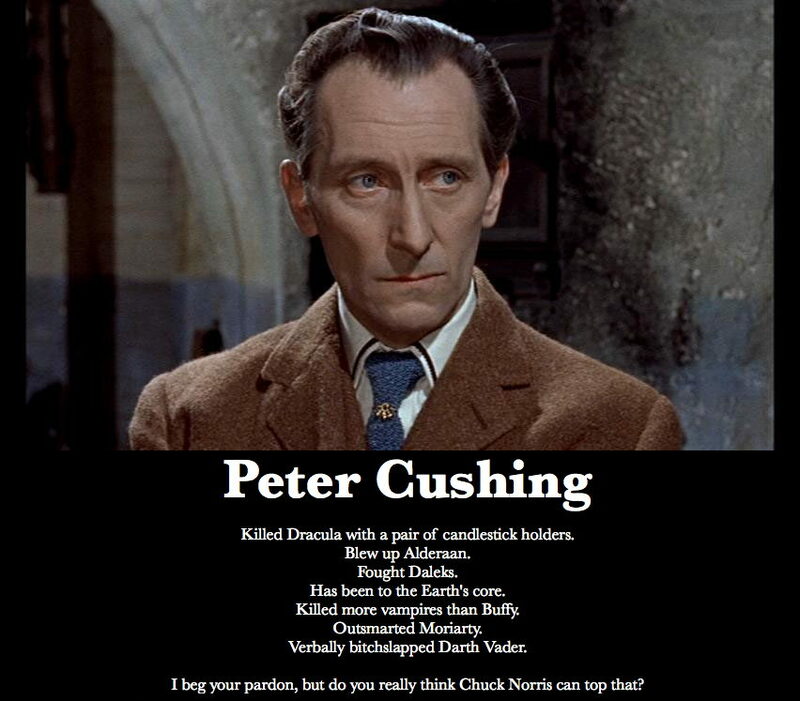 Although still active in films until the 1980s, Cushing was never the same. He died in 1994 at age 81. Halloween is the perfect time to sample the work of this most unassuming of horror stars. Cushing stars in "The Gorgon" and "The Creeping Flesh," airing back-to-back Sunday beginning at 5 p.m. CDT on Antenna TV (locally on digital channel WHNT-19.2). Then, on Halloween, Turner ClassicMovies will feature four of Cushing's films during a marathon of eight Hammer movies from 6:15 a.m. CDT until 7 p.m. First is "The Gorgon" again at 7:45 a.m., then "Curse of Frankenstein," "Frankenstein Created Woman" and "The Mummy" starting at 12:45 p.m.
And who wants to watch Chuck Norris movies at Halloween, anyway? Hey! This looks like a rip-off of Mr. Bill! Oh, nooooooooooooooooo! Culture Shock: 10.20.11: Whatever happened to the Halloween television special? Like a lot of things from the days when there were only three TV networks and cable TV was mostly reruns and wrestling, the prime-time Halloween special is largely a thing of the past. "It's the Great Pumpkin, Charlie Brown," a holiday staple since it first aired in 1966, is pretty much the sole survivor from that bygone era. It aired annually on CBS before switching to ABC a decade ago, a transition that came as a shock to those of us who grew up accustomed to seeing the swirling "CBS Special Presentation" logo — accompanied by a slightly alarming drum-and-brass fanfare — introducing each year's broadcast. Halloween-themed episodes of regular prime-time shows don't count. Besides, it's a little difficult to think of the "Treehouse of Horror" episodes of "The Simpsons," which have aired since 1990, as proper Halloween specials ever since Fox got the rights to the World Series and began delaying them until early November. That's like watching a Christmas special in January. By then, you're over it. The 1970s and '80s were a fertile period of Halloween programming. "The Fat Albert Halloween Special" began its run in 1977. What you need to understand about "Fat Albert," which was based on Bill Cosby's stand-up comedy routine, is that back then, childhood obesity was hilarious. Really, there was nothing better, especially if you tacked on a heartwarming life lesson. The heartwarming life lesson at the end of "The Fat Albert Halloween Special" is that old people are, indeed, people, too. More instructive in retrospect is the special's accurate depiction of trick-or-treating, which didn't yet involve parents hovering over you as you and your friends ventured from house to house wearing costumes unmarked by gaudy, reflective safety tape. It's a wonder I survived the '70s, what with all of the horribly dangerous behavior I engaged in. We called it childhood. 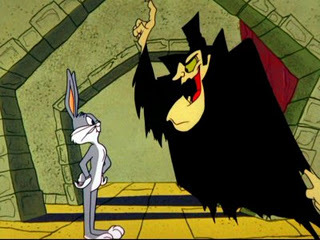 A year later came "Bugs Bunny's Howl-oween Special," a glorified clip show comprised of classic "Looney Tunes" shorts linked by new and distractingly inferior footage. But who cared if the new animation was lousy and Mel Blanc's voice had changed so much in the intervening decades that Bugs didn't always sound quite right? It was Bugs Bunny and Daffy Duck in prime time, and that's all any kid needed to know. But not every Halloween special was animated, and not all were instant classics. In 1976, ABC gave Paul Lynde, best known as the center square on "The Hollywood Squares" and Uncle Arthur on "Bewitched," his own special. It's on DVD now, but it aired only once, and with good reason. It was terrible. When I watched it recently, it was against my doctor's orders — he told me to avoid ham. Yet "The Paul Lynde Halloween Special" does have a secure place in television history because it featured an early TV performance by Kiss and established that the Wicked Witch of the West from "The Wizard of Oz" (Margaret Hamilton) and Witchiepoo from "H.R. Pufnstuf" (Billie Hayes) are sisters. It is also the only known instance of Tim Conway not being funny. By the end of the show, most of Kiss look like they're going to have a long, serious discussion with their agent. They wouldn't do anything this embarrassing again until their sans makeup period. The last gasp for Halloween specials was "Garfield's Halloween Adventure" in 1985, which had the advantage of being entertaining and airing before most people started to hate Garfield the way Garfield hates Mondays. At least I assume Garfield still hates Mondays, because it's not as if that joke ever gets old. You know, come to think of it, maybe there's a reason they don't make Halloween specials anymore. Few literary characters, with the exception of Sherlock Holmes, have been adapted to the screen as often as Dracula. The creation of Irish novelist Bram Stoker, Dracula has appeared on film since the earliest days of the medium. Not counting a lost Hungarian film from 1921 titled "Dracula's Death," about which little is known, the cinematic Dracula first appeared in 1922 — with name changed and serial numbers filed off — as the horrifying, rat-toothed Count Orlok of F.W. Murnau's German expressionist masterpiece, "Nosferatu." Dracula is again set to take to the screen next year in "Dracula 3D," directed by Dario Argento ("Suspiria," "Deep Red") and starring Dario's daughter Asia Argento ("The Last Mistress"). But of all the Dracula films both famous and obscure, one in particular is underrated and too often overlooked. Yet director John Badham's 1979 version of "Dracula" is arguably one of the best. Take nothing away from Bela Lugosi's performance in the 1931 edition, and all due respect to Hammer's bold, energetic 1958 retelling, "Horror of Dracula" starring Christopher Lee and Peter Cushing, but Badham's "Dracula" is a complete package. It's a gothic fairytale with beautiful sets, imaginative set pieces and moments of truly inspired horror. And it's just ambiguous, and ambitious, enough to be analyzed a couple of different ways. If you're into that sort of thing. Like most of the better Dracula films, Badham's diverges significantly from Stoker's book. Don't get me started on Francis Ford Coppola's "Bram Stoker's Dracula." That garish, parody-inviting misstep may be largely faithful to Stoker — apart from the addition of a standard-issue love story — but it looks increasingly ridiculous with age, done in mostly by bad acting (Winona Ryder, how could you? ), non-acting (I'm looking at you, Keanu Reeves) and overacting (paging Anthony Hopkins). In Badham's film, the characters of Mina and Lucy are essentially reversed, and Mina (Jan Francis) is the daughter of professor Van Helsing (Laurence Olivier), while Lucy (Kate Nelligan) is the daughter of an older-than-usual Dr. Seward (Donald Pleasence). Also, the setting is shifted forward from the Victoria era to the end of the Edwardian era. Dracula himself also differs from Stoker's original. 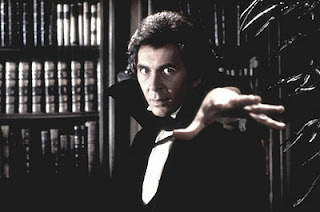 Played brilliantly by Frank Langella, who, like Lugosi, had first portrayed the role on stage, this Dracula is the seductive Dracula of popular culture, a romance-novel figure with feathered hair and open collars, who, in one scene, rides a horse through the evening fog, looking every bit like a Jane Austen hero. He owes as much to John Polidori's suave Lord Ruthven — a product of the same stormy night that gave the world "Frankenstein" — as to Stoker. Yet he's still a brutal, bloody figure, and Langella gives his lines real menace, as when he says to Van Helsing, "In the past 500 years, Professor, those who have crossed my path have all died, and some not pleasantly." And, more importantly, this vampire doesn't sparkle. Weaving through these proceedings is a grand, sweeping score by John Williams, fresh off his Oscar-winning "Star Wars" triumph and at the peak of his talents. It's one of his best film scores, and like the 1979 "Dracula" itself, it's unjustly neglected. Badham's "Dracula" is available on DVD and Netflix streaming. The DVD includes a director's commentary.